Cheap flight deals to Detroit, USA offered by Brightsun Travel – Book now! Detroit is the largest city in the US state of Michigan and one of America’s most exciting cities, set along the Detroit River. This iconic destination offers plenty to visitors; it has some great markets, vibrant street art, cultural neighbourhoods, a grand theatre district, incredible architecture, major sports venues, famous museums, world-class shopping and boundless forms of entertainment. What Detroit is most famous for though is its incredible music scene; the city is nicknamed as Motown due to being the birthplace of this world-famous record label, and is filled with plenty of live music venues, jazz clubs, theatres and more. Many internationally famous music festivals are held in Detroit, including the Detroit Jazz Festival and Movement Electronic Music Festival. Those interested in the city’s Motown heritage can head to the Motown Historical Museum, set in the Hitsville U.S.A which was a famous Motown recording studio. This heritage museum displays an impressive collection of Motown photographs, artifacts and memorabilia. Brightsun Travel offers an excellent selection of Detroit flights from India. Detroit is not short of amazing tourist attractions. Start by visiting the Detroit Institute of Arts and exploring one of the United States largest art collections, comprising of 65,000 artworks which span thousands of years, from ancient sculptures to contemporary masterpieces. Another notable attraction in Detroit is the Henry Ford Museum, a grand indoor and outdoor museum complex dedicated to the innovation of Ford, displaying a vast collection of artifacts including steam engine trains, historic airplanes, the famous Lincoln Chair and the Rosa Parks bus. Finally, a trip to Detroit is not complete without visiting the Eastern Market. This bustling market is one of the oldest and largest public markets in the US and a true landmark of the city with stalls selling fresh, local produce, including honey, cheese, meat and vegetables. Eastern Market has a very vibrant and cultural ambiance, offering shopping combined with music, colourful art and craft cocktails. 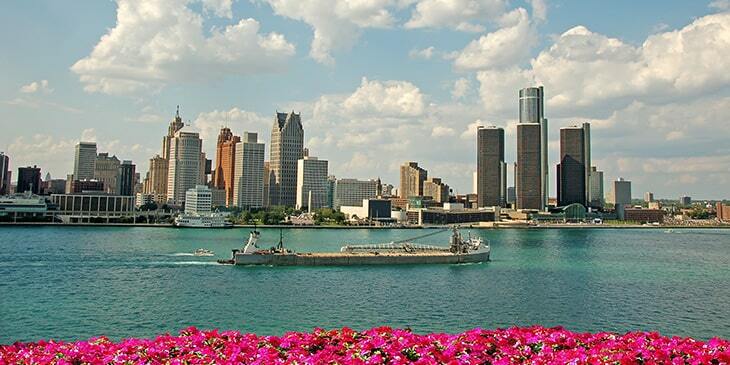 Book cheap tickets to Detroit with Brightsun now and start planning the getaway of a lifetime!